The euro had a relatively bullish week that nonetheless ended on a dangerously bearish note — one that may set the tone for the entire year in 2017. But before we get to that, I’d like to take this opportunity to wish you a fantastic new year. May all of your plans, wishes and goals come true! My general view for 2017 has been simple and consistent: the wave pattern strongly suggests that the market is about to experience a monstrous decline, as it heads into the center point of a long-term downtrend that should drag price even below parity within a relatively short period of time. Black wave (B) formed a contracting triangle labeled blue waves A through E, retracing 23.6% of black wave (A). Black wave (C) is most likely forming an impulse labeled blue waves 1 through 5. This main count sees blue wave 1 formed a very strong impulse of almost 800 pips. Blue wave 2 formed a double combination labeled pink waves w, x and y, retracing nearly 50% of blue wave 1. 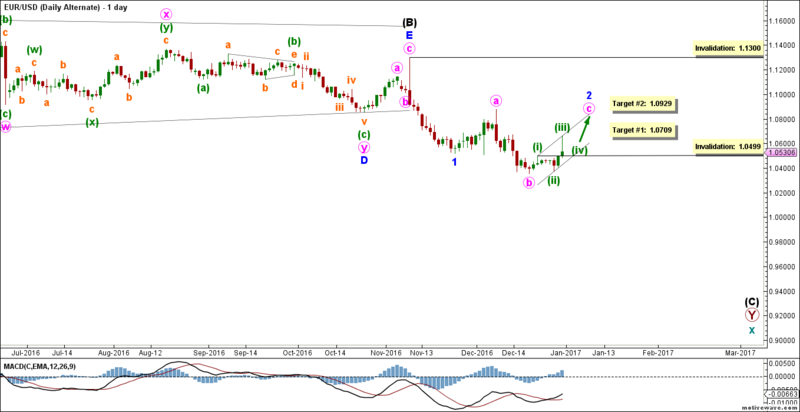 Within it, pink wave ii formed a zigzag labeled green waves (a), (b) and (c), retracing nearly 61.8% of pink wave i. Green wave (c) of pink wave ii ended with a very clear “shooting star” candlestick bar, which is typically a very reliable bearish signal. 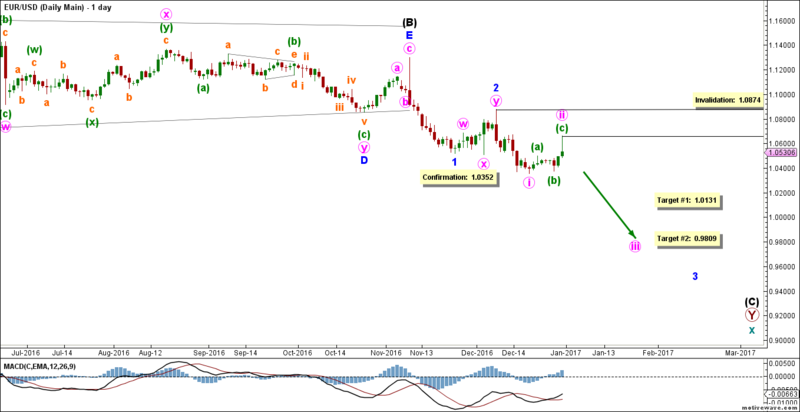 This count expects the euro to resume moving towards the downside in pink wave iii. This will be highly confirmed by movement below 1.0352. At 1.0131 pink wave iii would reach 100% the length of pink wave i, then at 0.9809 it would reach 161.8% of its length. This wave count is invalidated by movement above 1.0874 as pink wave ii may not move beyond the start of pink wave i. Once price moves below our confirmation point, we may lower the invalidation point to the end of pink wave ii, which currently stands at 1.0654. This alternate daily count sees that blue wave 2 is forming an expanded flat labeled pink waves a, b and c.
Within it, pink wave c seems most likely to be forming an impulse labeled green waves (i) through (v). 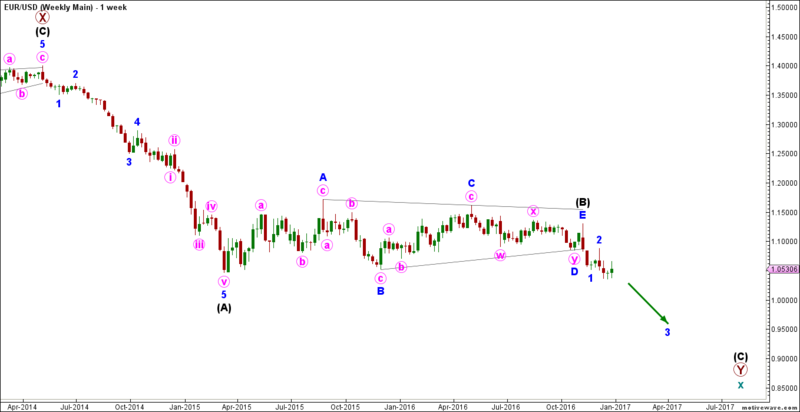 This count expects the euro to continue moving towards the upside in pink wave c to complete blue wave 2. At 1.0709 pink wave c would reach 100% the length of pink wave a, then at 1.0929 it would reach 161.8% of its length. This wave count is invalidated by movement above 1.1300 as blue wave 2 may not move beyond the start of blue wave 1. It’s also invalidated by movement below 1.0499 as green wave (iv) of this impulse may not enter the price territory of green wave (i). First off, let me take the chance to wish you a marvelous new year. May all of your plans, wishes and goals come true for you! On our previous analysis, we mentioned that evidence suggested the completion of wave (4) black. As expected, Cable continued unfolding downwards and we are updating our charts to reflect the most recent price action. Main count expects that Cable would resume its downtrend following the completion of an upwards correction. On the other hand, the alternate count expects that Cable`s upwards correction is mature and that Cable is getting to ready to make new lows. As always, we will wait for either count`s confirmation point to be reached to determine the highly probable count. Elliott Wave chart analysis for the GBPUSD for 29th December, 2016. Please click on the charts below to enlarge. N.B. : This count is presented on the 6-hours bar chart for clarification purposes. This count expects that within wave C maroon waves (1) through (4) black are complete and that intermediate wave (5) black is at its very early stages. Wave (4) black is likely complete as a triple zigzag correction labeled waves W, X, X, Y and Z blue. Wave Y blue unfolded as a flat correction labeled waves a, b and c pink. Wave a pink unfolded as a three wave structure labeled waves (a), (b) and (c) green. Wave b pink unfolded as a three wave structure labeled waves (a), (b) and (c) green. Wave c pink unfolded as an impulse labeled waves (i) through (v) green. The second wave X blue unfolded as a zigzag labeled waves a, b and c pink. Wave Z blue unfolded as zigzag labeled waves a, b and c pink. Wave b pink unfolded as a triangle labeled waves (a) through (e) green. Wave c pink unfolded as an ending diagonal labeled waves (i) through (v) green. This count expects that within wave (5) black waves i through iii pink are complete and wave iv pink has started unfolding upwards. Wave ii pink unfolded as an expanded flat correction labeled waves (a), (b) and (c) green with wave (c) green unfolding as an impulse labeled waves i through v orange. Wave iii pink unfolded as an impulse labeled waves (i) through (v) green with wave (v) green unfolding as an impulse labeled waves i through v orange. This count would be confirmed by movement above 1.2311. At 1.2324 wave iv pink would reach 0.236 of wave iii pink and at 1.2400 wave iv pink would reach 0.382 of wave iii pink. This count would be invalidated by movement below 1.2200 as within iv pink no B wave may retrace more than 100 % of its A wave. As well, this count would be invalidated by movement above 1.2571 as wave iv pink may not enter the price territory of wave i pink. This count expects that wave iv pink is complete and that wave v pink has started unfolding towards the downside. Wave iii pink unfolded as an impulse labeled waves (i) through (v) green. Wave (v) green unfolded as an impulse labeled waves i through v orange with wave iv orange unfolding as a triangle. Wave iv pink unfolded as a double combination labeled waves (w), (x) and (y) green. This count would be confirmed by movement below 1.2200. At 1.2185 wave v pink would reach 0.618 of wave i pink and at 1.2107 wave v pink would reach equality with wave i pink. This count would be invalidated by movement above 1.2311 as within wave v pink no second wave may retrace more than 100 % of its first wave.